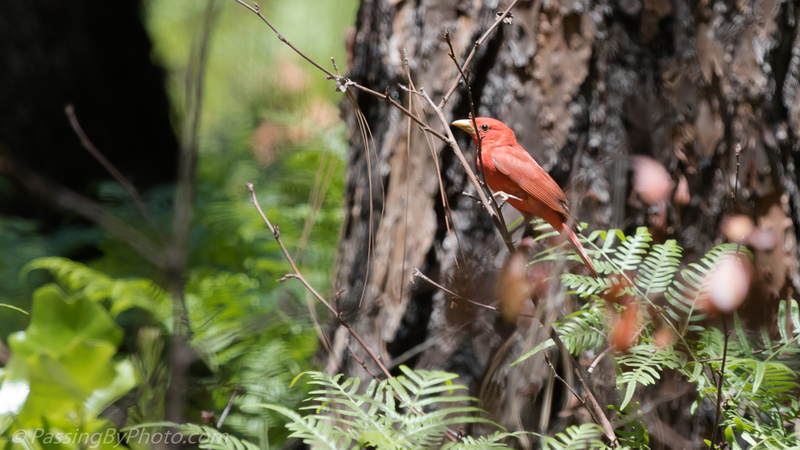 Despite seeing Northern Cardinals pretty regularly, I found it a challenge to get a good image of one. 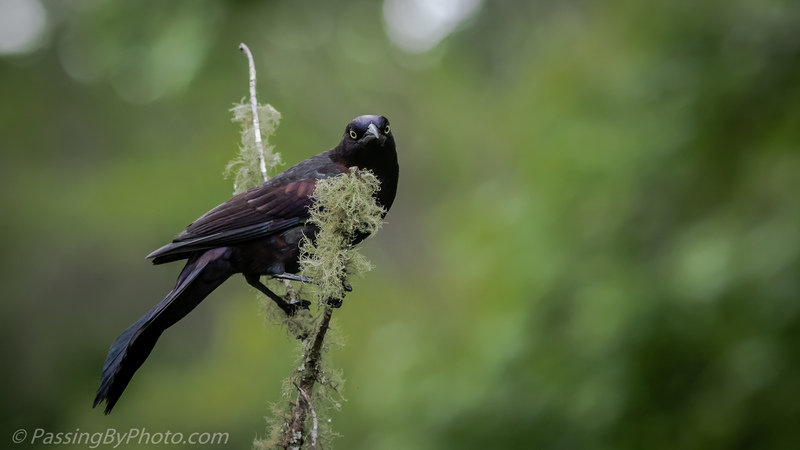 This one surprised me landing over my head as I was watching warblers at ground level. 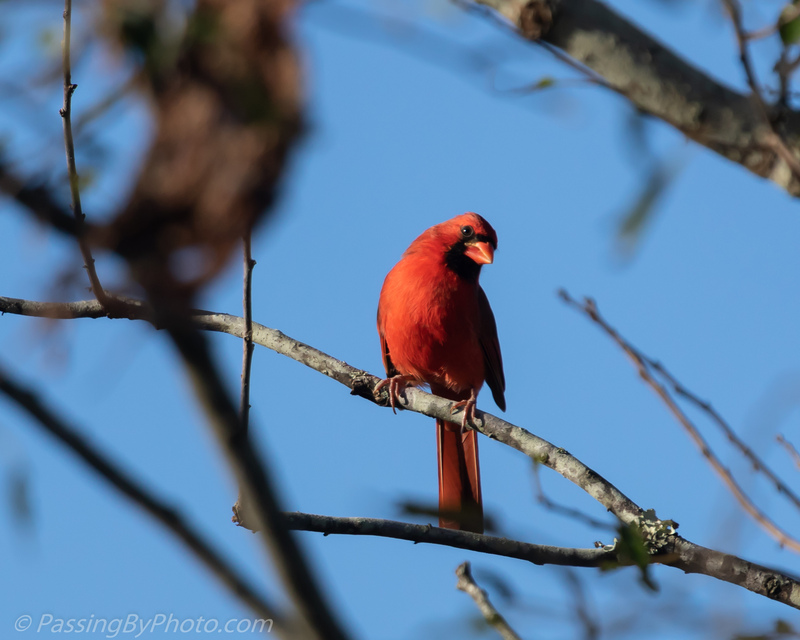 He had a lot going for him: classic pose with his crest up, aligned to the sun for the catch light in his eye, his feathers tidy and uniformly colored and oh, yes, that red. Most of the leaves had fallen off the tree where he perched giving me a clear view. 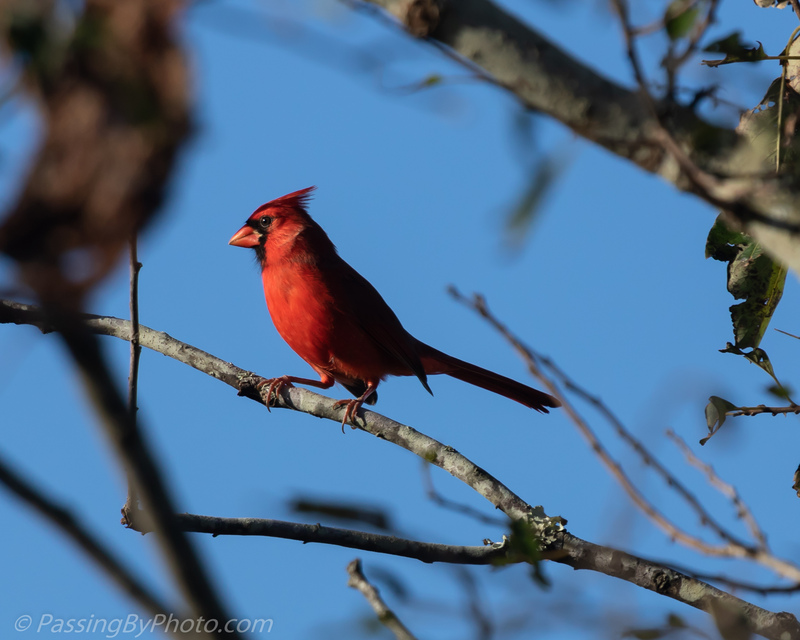 Cardinals in our area tend to be quite skittish; this one didn’t seem to care that I was watching him. 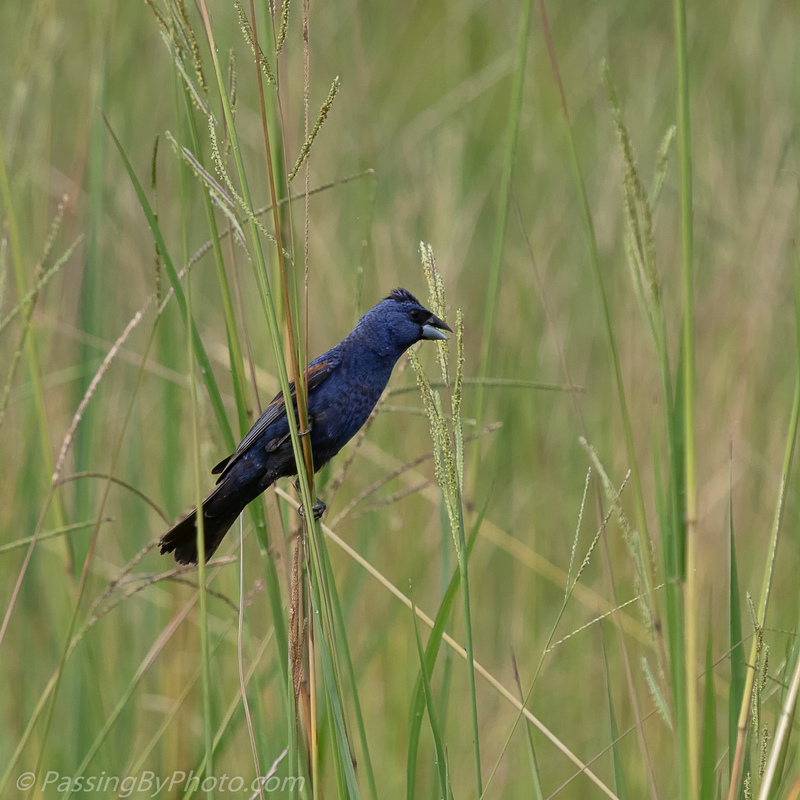 It was easy to see this Blue Grosbeak flitting along in the grass of a roadside field, although I wasn’t sure what it was. I eased out of the car and was able to get an image with a clear view of his head. Grosbeaks are in the Cardinalidae family along with Cardinals, Buntings and Tanagers, all identifiable by their prominent bill. The Blue Grosbeak is slightly larger than an Indigo Bunting and breeding males have chestnut wingbars. 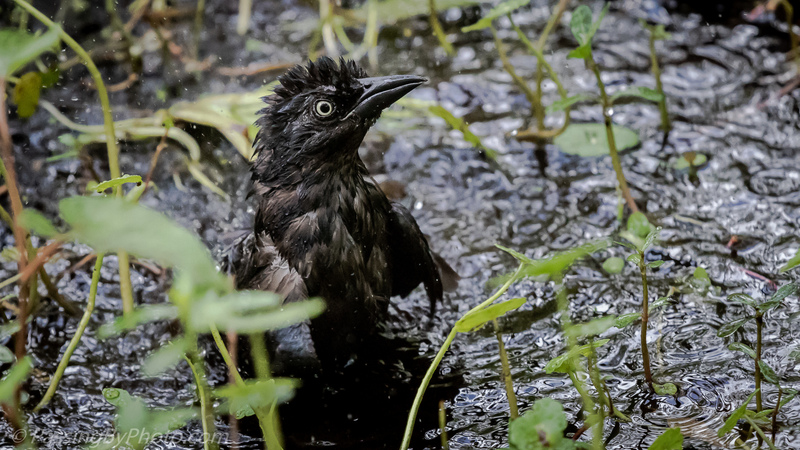 Wouldn’t a late afternoon bath be refreshing? Hanging out over the swamp waters makes it an easy task. 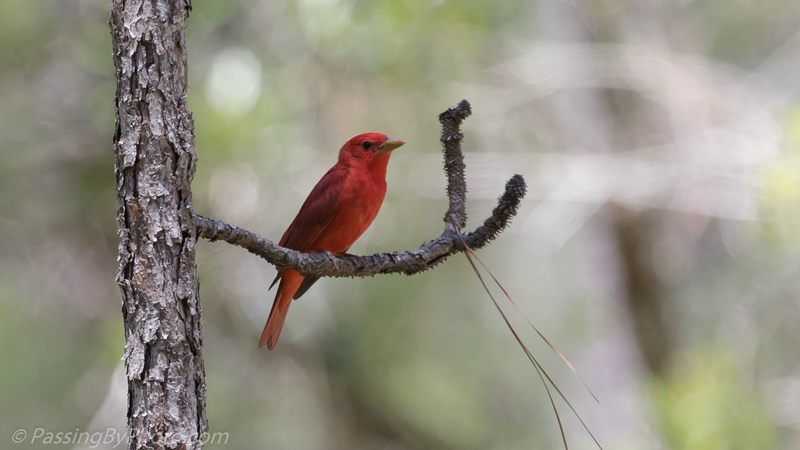 A flash of red appeared in the middle of the road in front of us as we were leaving a wildlife management area. My first thought was Cardinal, but the shape wasn’t quite right. 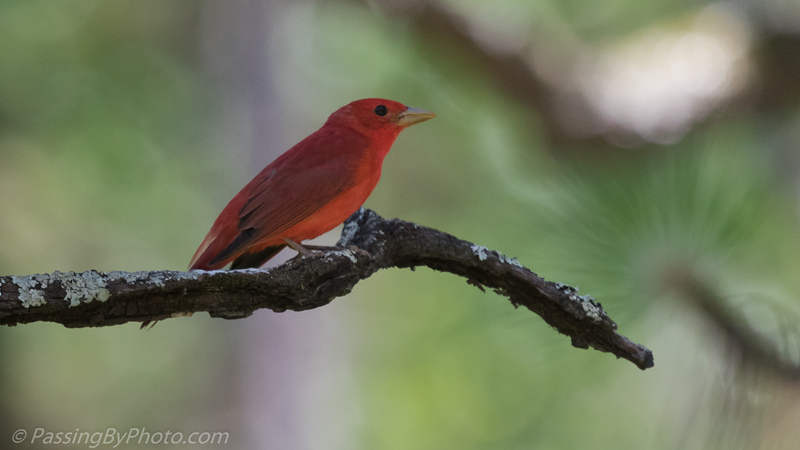 A peak through my zoomed out lens revealed that it was a Summer Tanager! 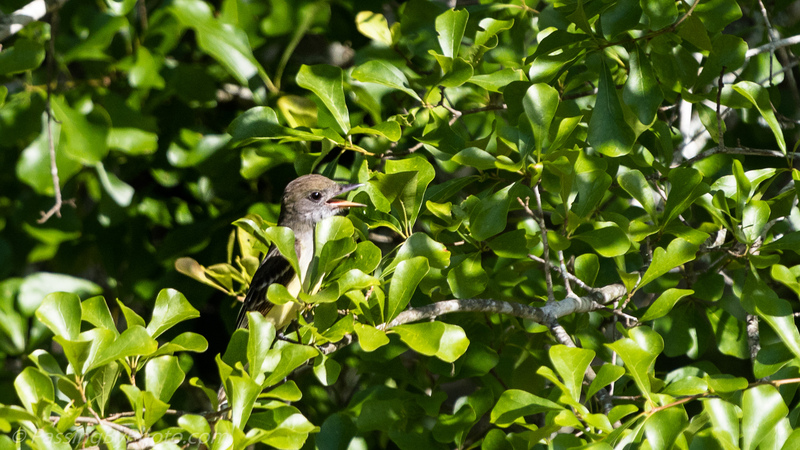 He flew to a nearby tree and I got a couple shots out the window. There was room to pull over and I stealthily got out of the car. 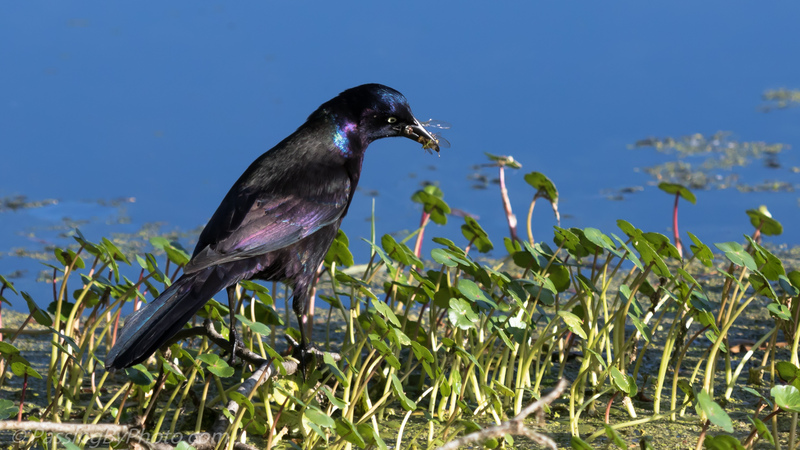 The perch he selected wasn’t the best for a clear view, but his color in the patch of sun out-weighed a stick across his face for me. Turns out there were actually three or four of them zipping around, including at least one female. The female is yellow and her color was too close to the the leaves where she landed and too far away to get a focused shot. Then they all scattered into the woods when another car approached. 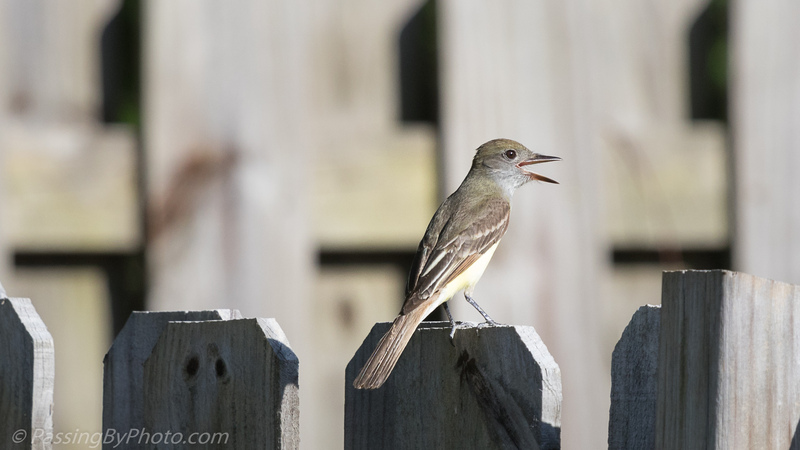 Some afternoons in the spring our backyard is a highway for small birds traveling along the edge of the woods. 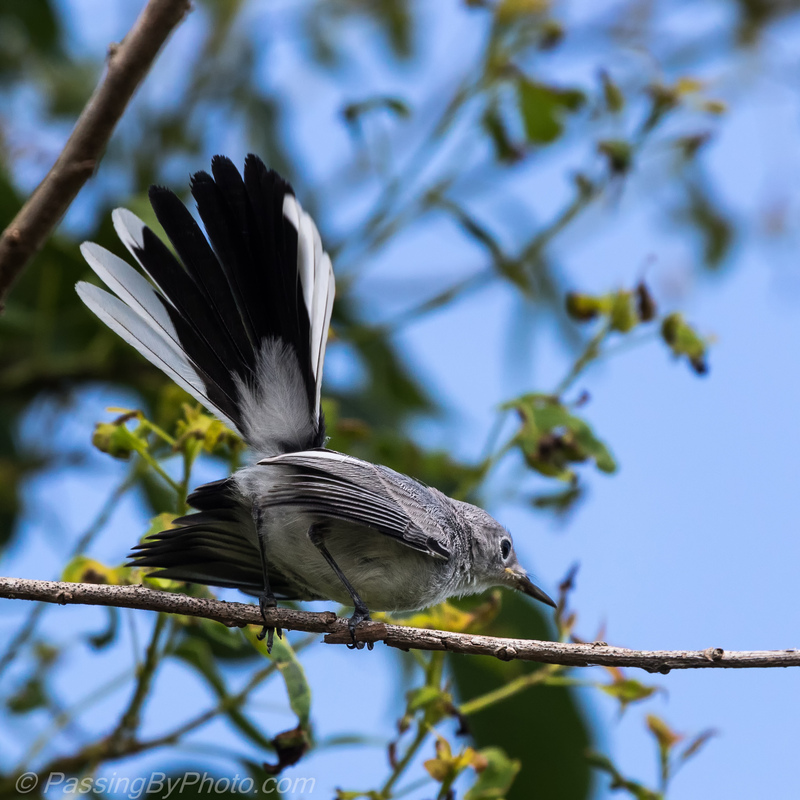 They generally don’t stop long, but this bird was probably a juvenile and appeared to be waiting on some parental guidance. 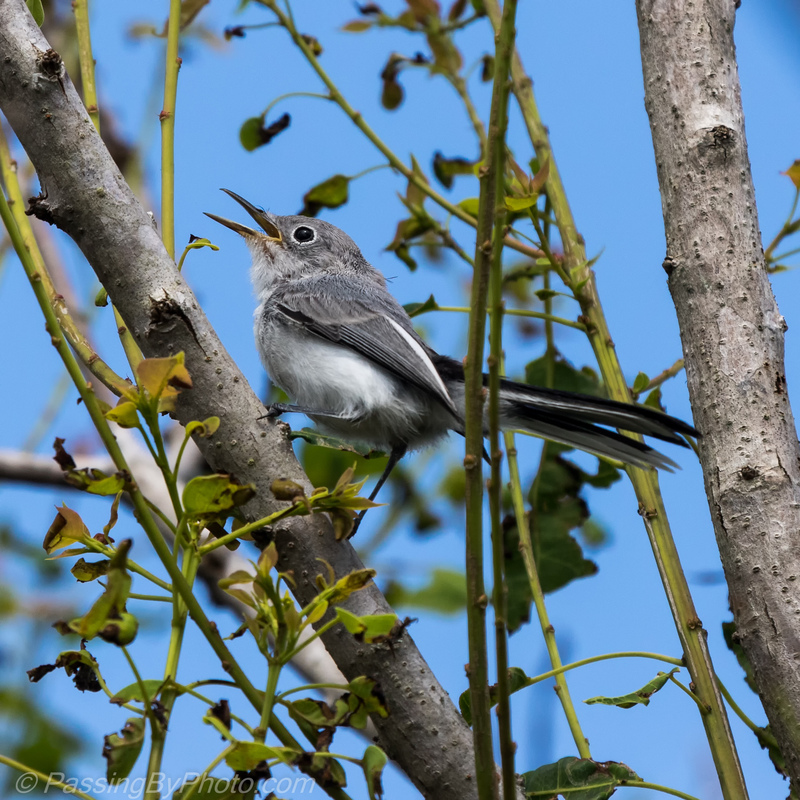 The Merlin Bird ID app identified this as either an Ash-throated Flycatcher or Great Crested Flycatcher from the two photos below. 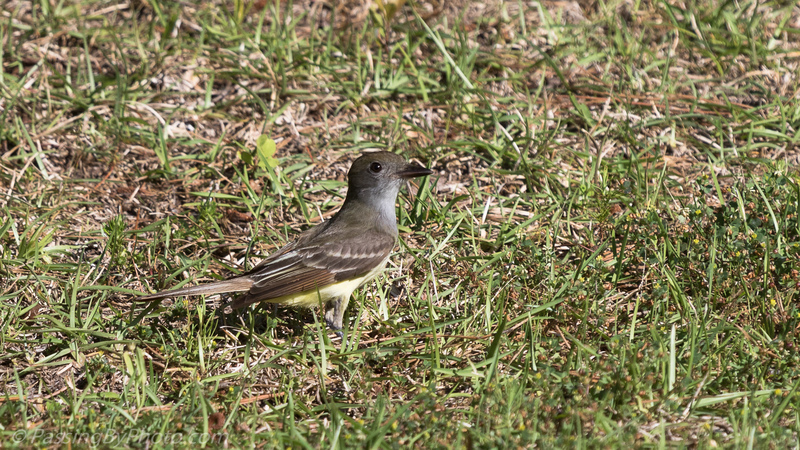 The Great Crested is most likely to be found in South Carolina. Also, the “lemon-yellow belly” description of the Great Crested was what first made me notice him as it flashed in the sun. 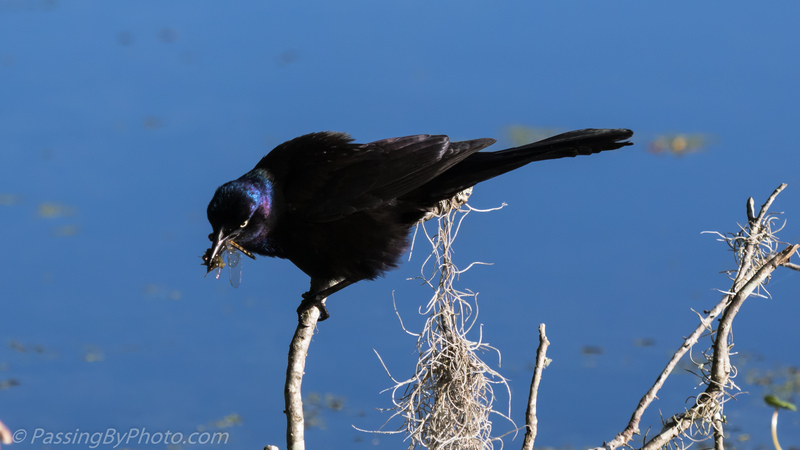 With his mouth full of bugs this Grackle paused a couple minutes at the edge of the pond before flying off to his nest. 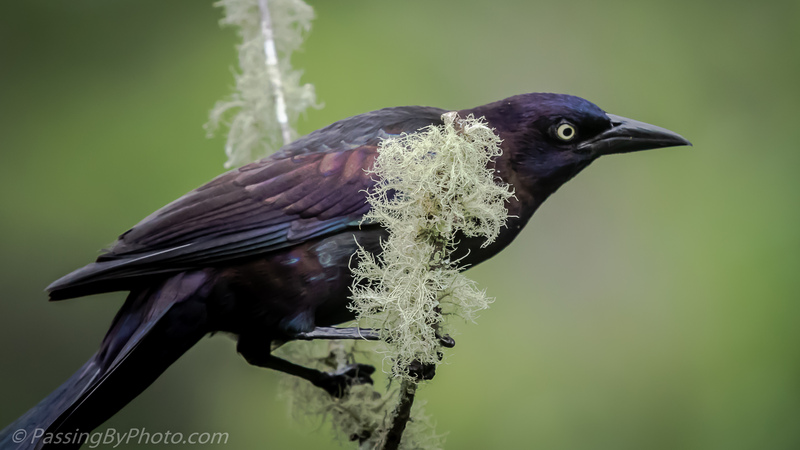 I didn’t see him make the catch and have no idea how he got these two bugs in his beak at once. 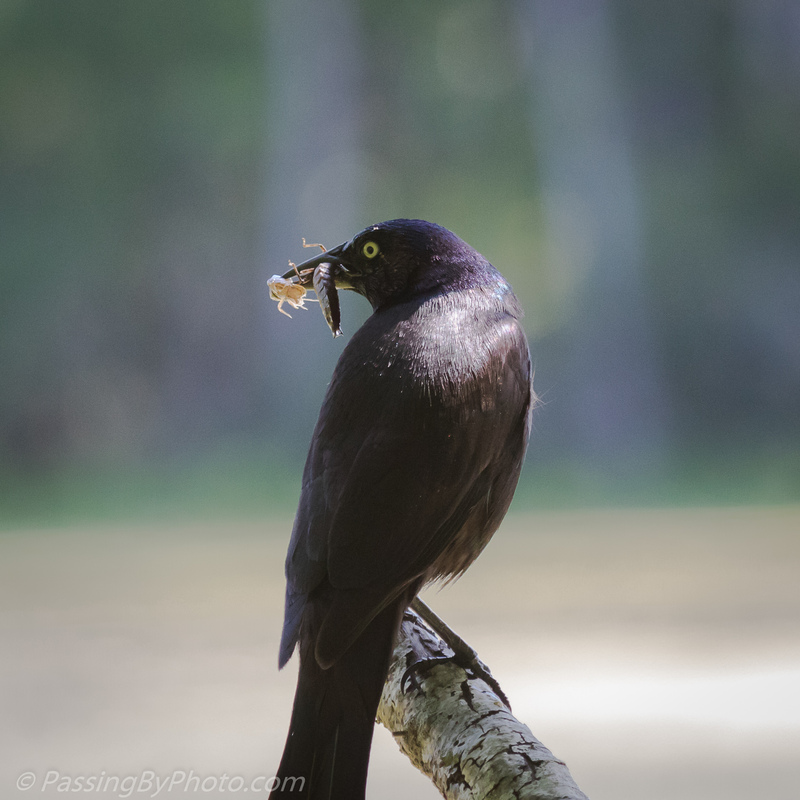 Maybe the effort was why he rested before heading to his nest. 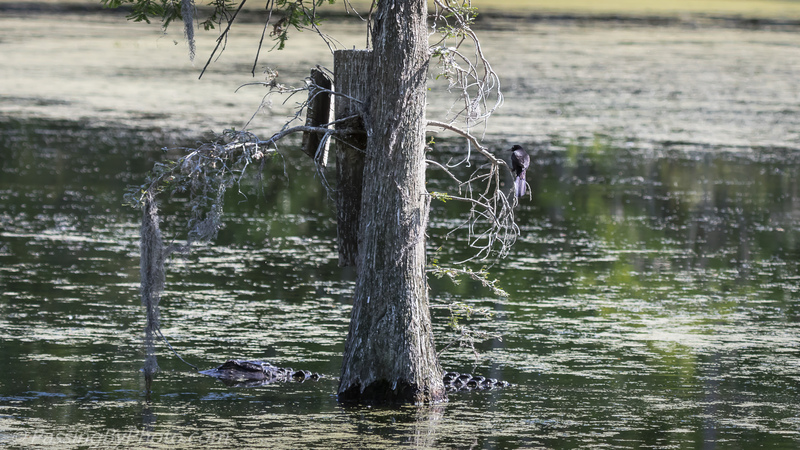 He eventually flew out to this tree, aka “the skinny tree,” where his nest seemed to be in the broken Wood Duck box seen on the far side of the trunk. An Alligator was patrolling the water around the tree. 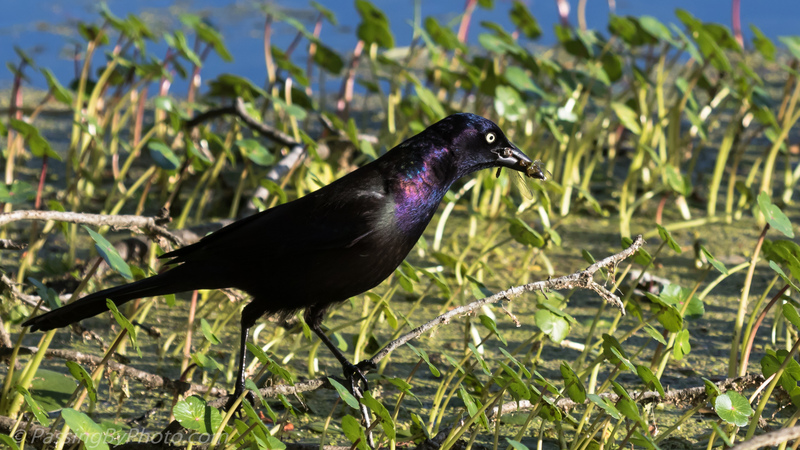 The Grackle dive-bombed the Alligator several times with no effect. 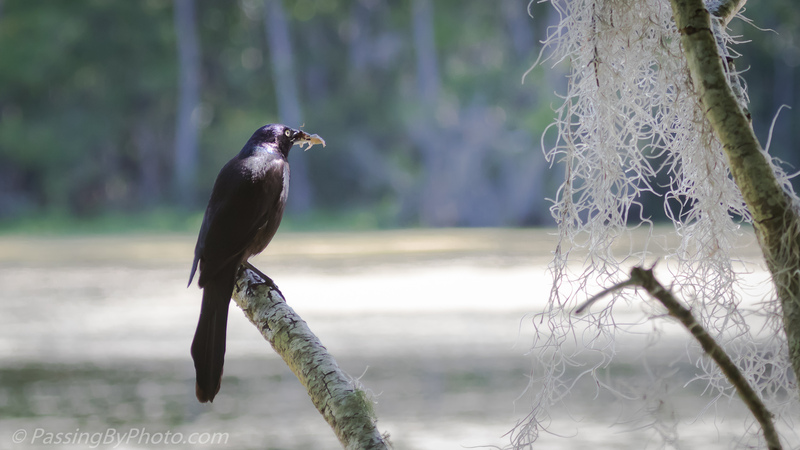 There was at least one turtle in the water and there is one Great Blue Heron and three Great Egret nests with chicks in the branches above, either of which would be more enticing to the gator. 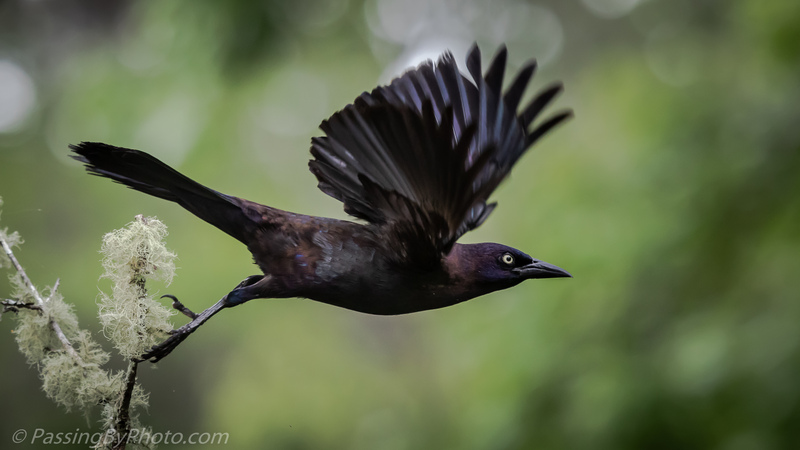 I spotted this shimmery Grackle not far from those I saw earlier in the month poking in the water. 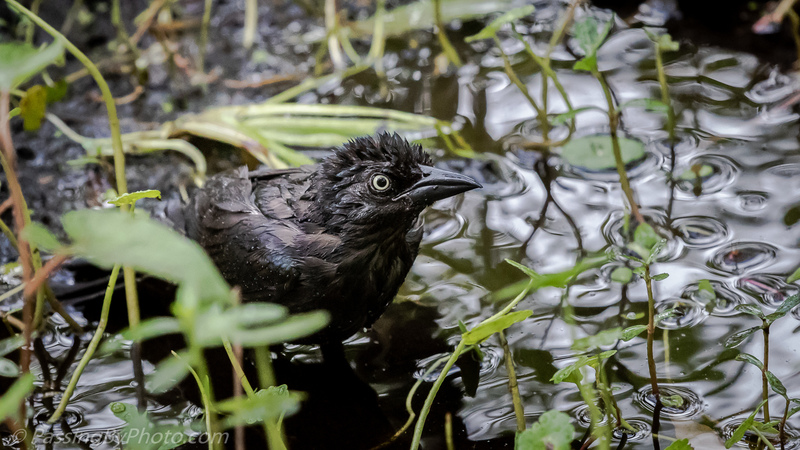 This one had caught a dragonfly and was attempting to dunk it in the pond. He jumped closer to the water and bent down a few times but didn’t seem satisfied. As sometimes happens, I got distracted by other activity around the pond and didn’t see if he had success or just flew off.